There are many ways to use vines in the landscape. Whether you need something to cover up an eyesore or simply want to beautify a trellis, zone 9 vines are there to serve. Choosing the right site and ensuring that a plant is hardy in your zone are two key aspects to selection of vines. Vines that climb in zone 9 must be tolerant of extreme heat in summer and little natural moisture. No matter, there are plenty of vigorous, tough vines that will thrive in zone 9 gardens. Climbing vines help direct the eye up to encompass many architectural details in the landscape. They also may produce flowers, fruit, attract butterflies or pollinators, feed birds, shade an area or simply cover up a failing fence or other structure. Most of the vines for zone 9 are tough and need little extra care outside of watering and training them to a trellis or arbor. Climbing vines do need support to produce the best plant possible. Fast growing vines that can cover an area quickly with scented blooms or masses of color are a winning landscape feature. 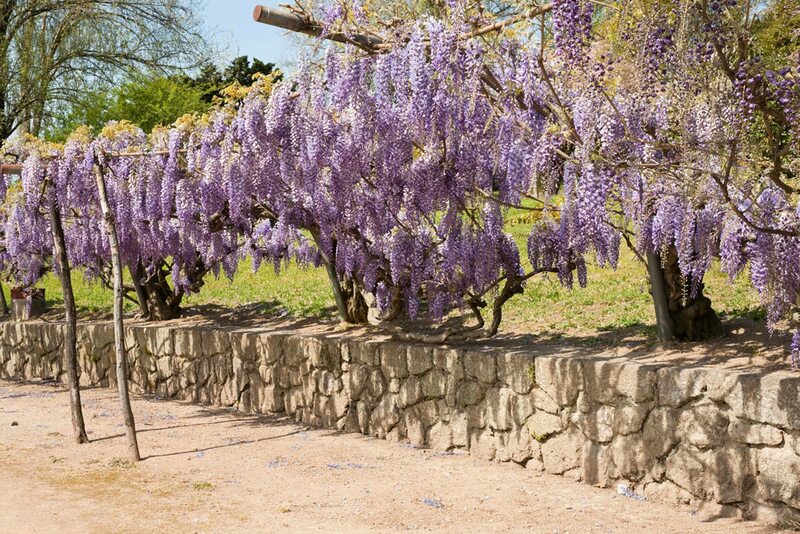 The old-fashioned Japanese wisteria is hardy in zone 9 and will produce copious dangling racemes of beautiful blooms, but it can escape and become a nuisance. The American wisteria is better behaved and has lovely lavender flowers. Equally vigorous, Carolina jessamine is evergreen, native and produces tubular, bright yellow flowers for up to 6 weeks. Although annual plants don’t offer year round interest, there are some interesting species that can add excitement and drama to the garden during the growing season. Black Eyed Susan vine is one of the cheeriest plants around. It twines up readily and has 5 deeply yellow-orange petals with a dark black center. Corkscrew vine is an oddity with strange lavender flowers that twine upon themselves. Mandevilla is one of the more tropical climbing vines for zone 9. It has large usually pink but also red and white blooms that resemble a Hibiscus. Canary vine is another great performer, which bears small but copious deeply lobed, skirted yellow blooms. Climbing vines for zone 9 don’t have to bloom to be attractive. Boston ivy is hardy in many zones including 9. It has attractive glossy leaves that turn astounding hues of orange and red in fall. Another great foliage vine is Virginia creeper. It also has great fall color and climbs anything by itself with adhesive tendrils. Tri-color kiwi is also a flowering vine but its foliage is incredible with tones of green, pink and cream. Another of the classic zone 9 climbing vines is English ivy. You have seen it adorning many regal buildings. This is an excellent choice for a full to partial shade setting.